The song “Little Things Mean a Lot” reminds us that in relationships, simple signs of affection—a touch of the hand or a kind word—can be very important and can mean a lot to the ultimate health of the relationship. The same is true for our little faults and failings. We know they can lead to bigger failings and can ultimately destroy something precious in our life. 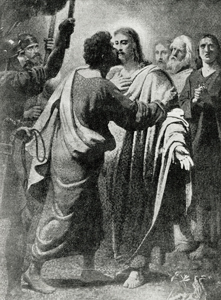 The Gospel says that Judas was a thief who stole from the common purse of Jesus’ small community. We know how Judas’ little betrayals led to the final betrayal of Jesus Himself. Often we do not see our little failings as being very important, but if they are unchecked, we know they can lead to bigger failings, to bigger betrayals. Today’s Gospel reminds us to pay attention to our big failings and also to our little failings because little things, positive and negative, can mean a lot to the health of our relationships with others and with Jesus.